Concepts and architecture: Provides an overview of provisioning concepts and introduces Tivoli Provisioning Manager V7.1.1 concepts and architecture, in perspective with the overall Tivoli process automation engine platform. Planning for deployment and implementation: Discusses planning considerations for deploying Tivoli Provisioning Manager V7.1.1 in a production environment, installation and initial customization of product components, and a sample software deployment scenario to verify the successful deployment of the product. The new GUI and IBM Service Management integration scenarios: Covers value added integration scenarios with several IBM Service Management products such as TADDM, IBM Tivoli Service Request Manager, and CCMDB. 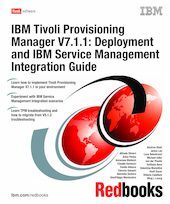 Also included is a section explaining the Start Center based new GUI, and a section on implementing Tivoli Provisioning Manager V7.1.1 with a non-IBM configuration management database. Patch Management, Operating System Deployment, and IBM Tivoli Monitoring Agent for Tivoli Provisioning Manager: Introduces several scenarios on Patch Management and Operating System Deployment, Also provided is an overview of the IBM Tivoli Monitoring Agent for Tivoli Provisioning Manager. Troubleshooting and migration from Tivoli Provisioning Manager V 5.1.2: Discusses troubleshooting tips and migration from V 5.1.2.